So, today I had a meeting with myself and decided that I couldn't stand it any longer, I had to do some 7mm work. I noticed that over the last while my enthusiasm for 4mm was waning and figured a change was in order. 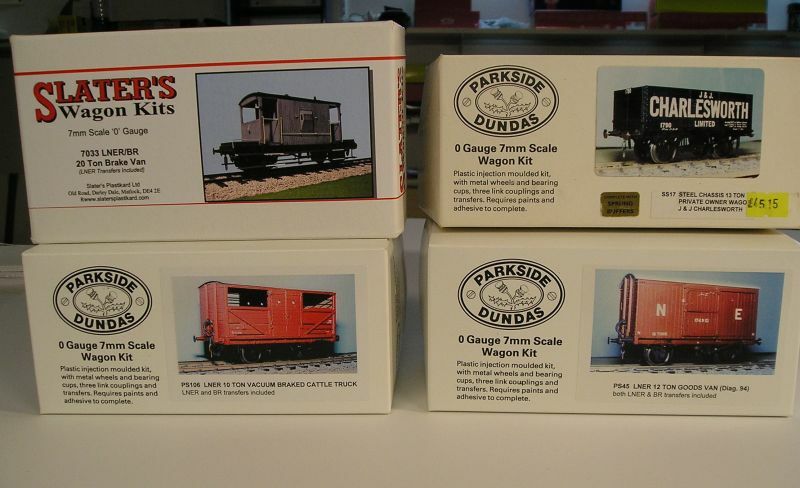 This evening I ordered a LNER/BR brake van from Slaters and from Parkside Dundas a LNER Cattle wagon, goods van and PO wagon. 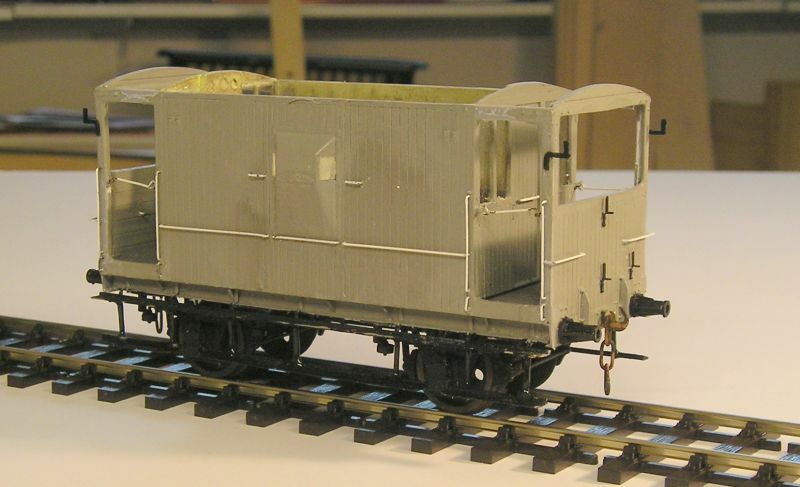 I wanted to start the kit I do have which is a PD LNER 20T brake van E64. These were built in the 30s so by the 60s they were nearing the end of their life. I've made some progress this evening by drilling the sides for handrails. Dimples are helpfully provided so that was foolproof. 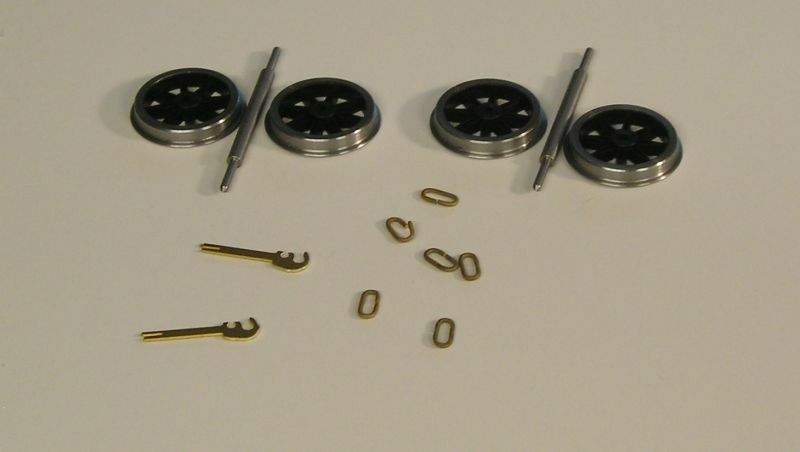 Being me of course I want to make the van sprung so I got myself some sprung bearing carriers by Bill Bedford. These can be had at Eileen's Emporium. The bearing carrier is attached to length of steel wire (~0.10mm). This is free to move up and down in the carrier holder. I need to determine the position relative to the W irons to make sure the bearing has travel around the centerline. This morning I put the sides and ends in the paintshop for grey primer. I want to do the interior so that needs to be painted before assembly. Glazing can only be put in after paint. 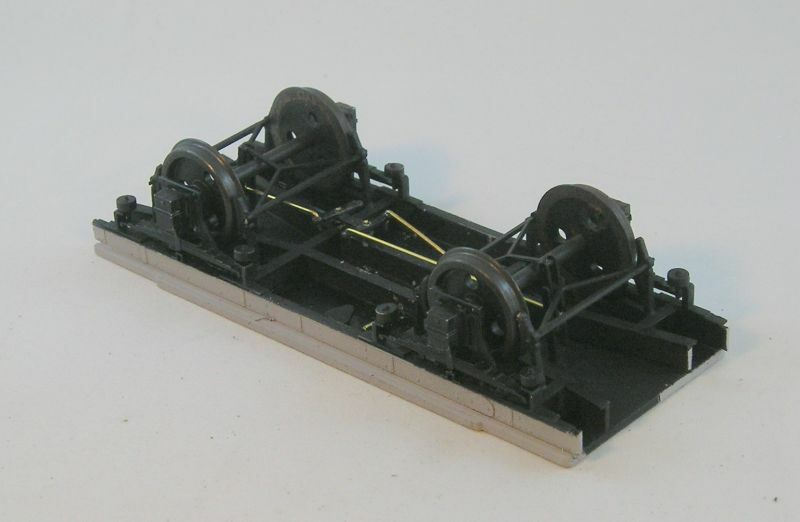 I also worked on the underframe. After futzing about with various thicknesses of shim, I finally settled on 0.060" for the bearing carriers. I used contact cement to fix the carrier to the shim. The height seems about right but I won't know for sure until I get further into the build and I can see the buffer height. From the drawing I guesstimated where the neutral ride height should be and marked the plastic W iron with pencil which you can just see. The spring is pushing the bearing beyond that at the moment but when the van is weighted things should be right. I was a tad concerned that the thickness of the brass carrier holder would prevent the wheels from going into the bearing, but all is good. You can see that the wheels have been chemically blackened using the stuff for brass (Carrs) from C&L. Axleboxes have been fixed and I'm pleased to say I avoiding gluing everything solid. You can also see the subframe. I had to cut notches on the crosspieces to clear the bearing carriers. Rainstrips are 0.020" plastic rod. Run this between thumb and forefinger to impart a curve. I did make a bit of a mess but this should rub out with a fiber pen. When doing these adjust them with metal tools. It is easy to get a fingermark in the wet glue which is difficult to remove. I positioned the ventilators by plotting the location from the drawing supplied - I'm not sure they're absolutely right. At least the position of the stovepipe is obvious. Yesterday I worked on the brake gear. It was quite a job to get my head around how this goes and I did make a booboo which fortunately I was able to correct. I've only rigged the outer brakes. 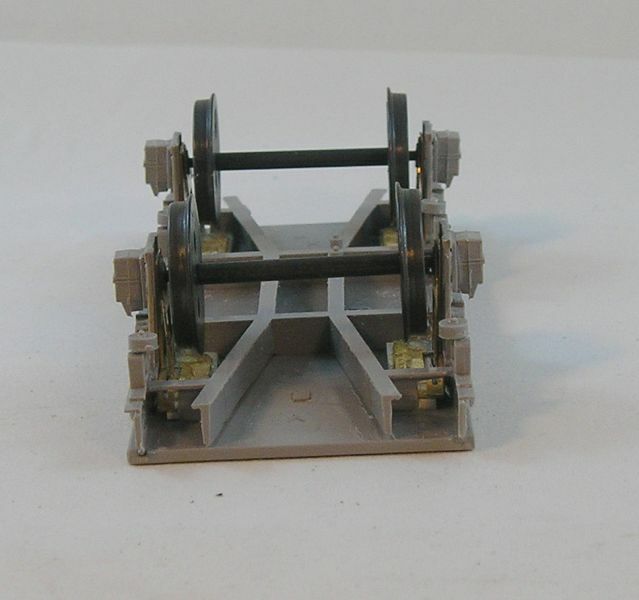 This because to complete the rigging the wheels have to installed and there is a pull rod which prevents the wheels from being removed afterwards. 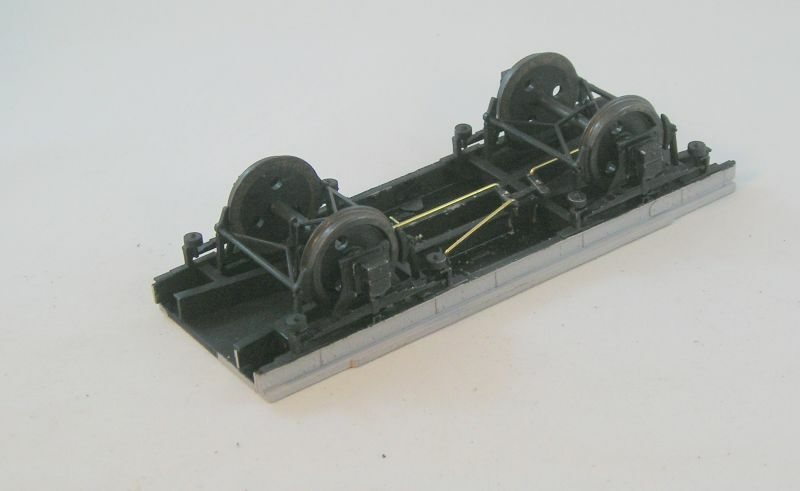 I've primed the underframe and will paint it black next. The outer yokes are part #25 on the drawing. There is a swing link that I haven't glued yet which will connect to the inner yoke #24 (not shown). 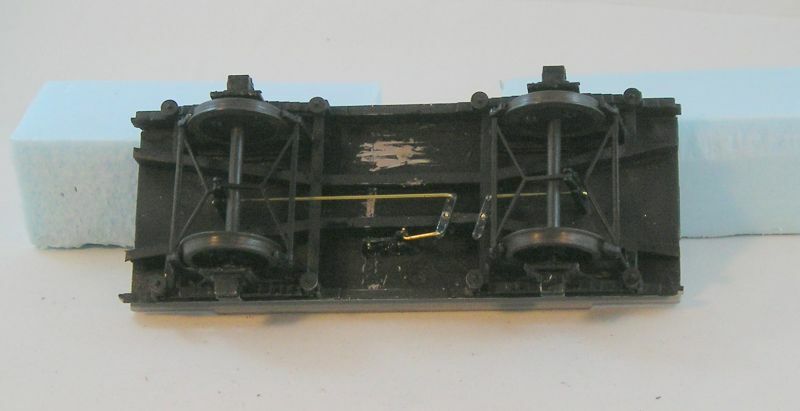 Part #61 is actually brass wire that will run from the actuator (on the right side of the underframe). I've got the underframe in the paint shop and the black is drying. These are supplied in the kit. They are of course plastic. 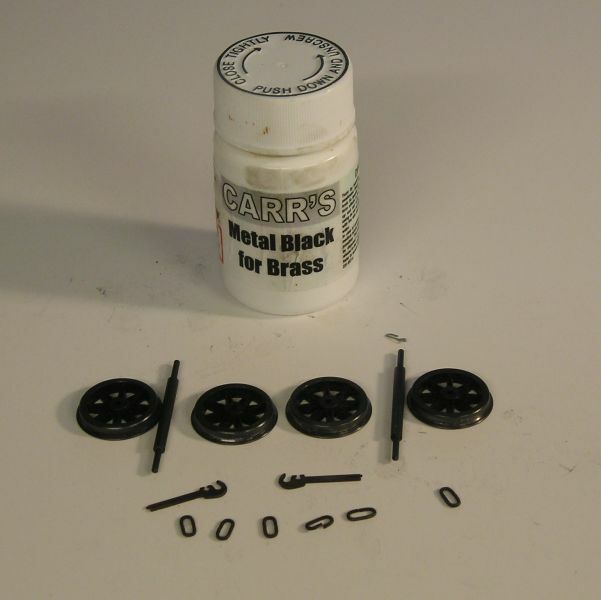 The black sprue contains the hangers among other things. Anyone who has built a plastic brake van kit will know that the plastic stepboards are very fragile. I have a PD model with tragically broken stepboards. These are difficult to repair. The hangers are 0.020" brass wire. I used a plastic hanger as master and made a wooden jig with holes to position the legs accurately. I soldered two lengths of wire, one for each leg. I then trimmed the legs and bent the assembly to mimic the plastic hanger. I marked the pliers with the location for the bends so they're all close to being the same. When I come to assemble this lot, I'll see how well I did. The stepboards are brass strip. By a stroke of good luck I had a couple of lengths of exactly the right width. I made the rear edge by soldering 0.032" wire on. The secret to doing this is to tack in several places first getting the wire aligned with the back of the step. I then went back and filled in the back with solder, always trying to do that at different places. My great fear when doing this is that I'll desolder everything - that didn't happen. I did use 188C solder, maybe that helped. Finally I applied solder to the front of the wire to hide that its wire. This was cleaned up with curved Exacto blade, file and fiberglass pen. Rigging complete.You can see how the inner yokes connect to the top of the swing links. The brass pull rod connect to the bottom of the swing links. You can also see that the wheels won't come out now. I do have one beef. 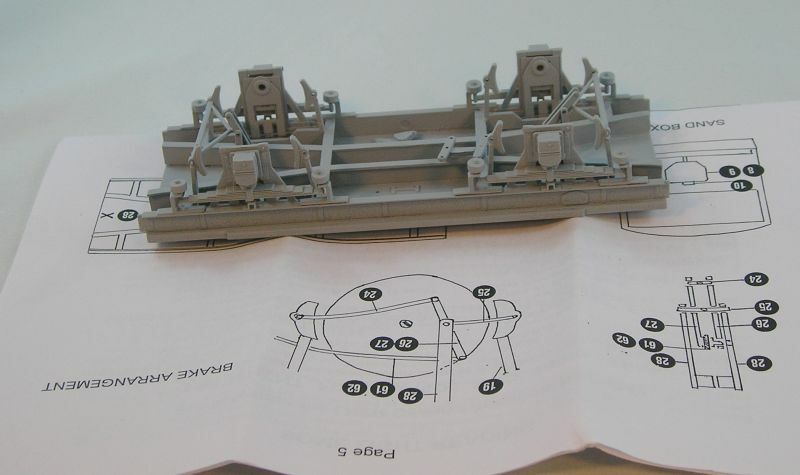 The instructions are very vague on how the crank is supposed to connect to the handbrake wheel. I passed some wire from the main crank through the subframe to another crank (you can just make it out in the top picture) which I believe is below the handbrake wheel in the cabin. Should have bought the drawing I guess. I can finish painting now. The side on the left has a half length bench seat and partition. The stove will go the left of the partition. The side on the right has a full length bench seat. The lower colour that I chose is Wisconsin Central Maroon. In pictures the lower half is red. The top half is Aged White. Before assembling I will streak these with weathering powders to give it a lived in look. Almost embarassingly simple. The instructions could have been done better.There's a double crank just below the I beam. The left end is connected to the handbrake wheel in the cabin. The right end drives the main crank. I'll touch up the paint next. I am amazed and pleased at how well these turned out. I did have to tweak things here and there but everything is quite straight. My only disappointment is that the hangers are not flat as they should be. I did try to solder some 1mm PB strip to the hangers between the steps but couldn't get any access. Perhaps next time I'll do better. 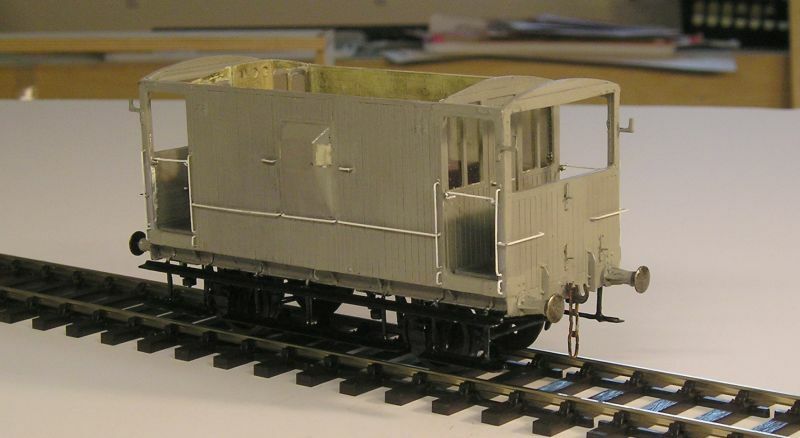 I do have a Slaters Dia 61 brake van coming. Things are a bit of a mess and I have ordered some BR grey paint which should arrive in a day or so. Assembly should be plain sailing now. Couplings are installed and buffer shanks are in. I fitted the handrails and lamp brackets today. Next step is to touch up the paint - it has got knocked about with handling and fettling. I think for my next project, I'll do the PO wagon. After the fairly complex brake this should be quite simple. 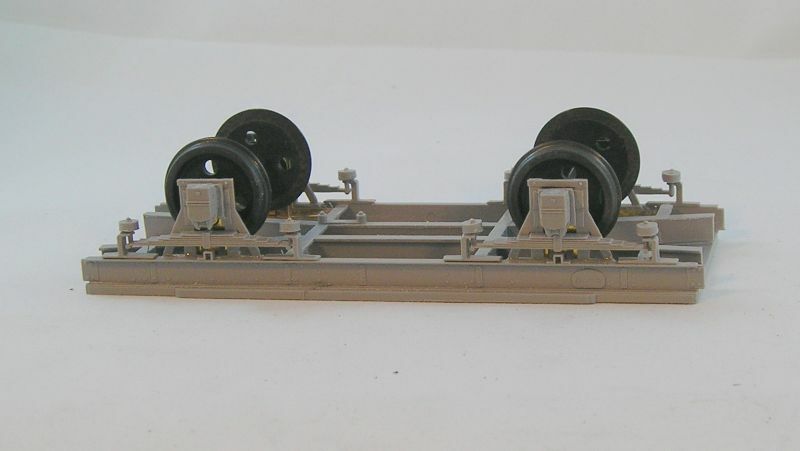 It is complete with wheels, bearings, buffers and couplings. I will add the Bill Bedford sprung W irons. I like these and the wagon runs more convincingly when sprung. 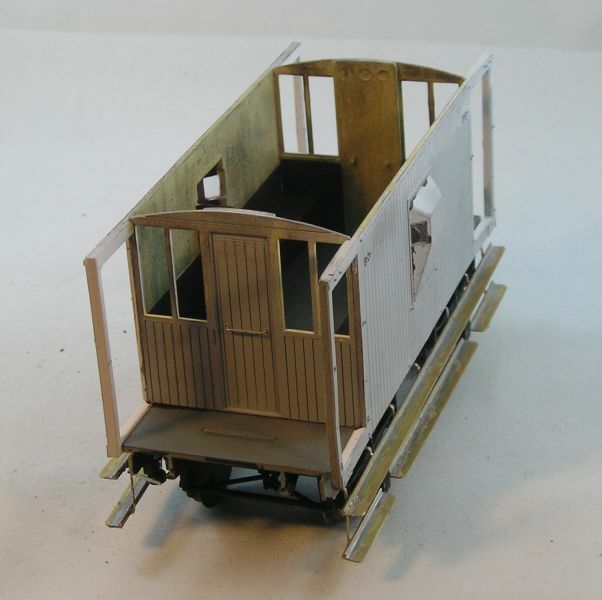 In a fit of productivity I started the PO wagon kit. After rubbing the excess deposit of with a tissue, the parts attain an attractive patina. The bottle says "for brass" but it works on NS and steel. It won't work on Aluminum I believe. These are well detailed and should be unpainted wood. After 40 years the wood would be distressed so I had a look at what Martyn Welch had to say in his book "The Art of Weathering". Before painting, I rubbed the insides with coarse sandpaper to try to get a grain effect. I've done the painting and will continue the process tomorrow. You can see the bearing carrier is attached to a steel wire which is suspended between the ends of the W iron. Whatever you do, it pays to take as much care as you can. 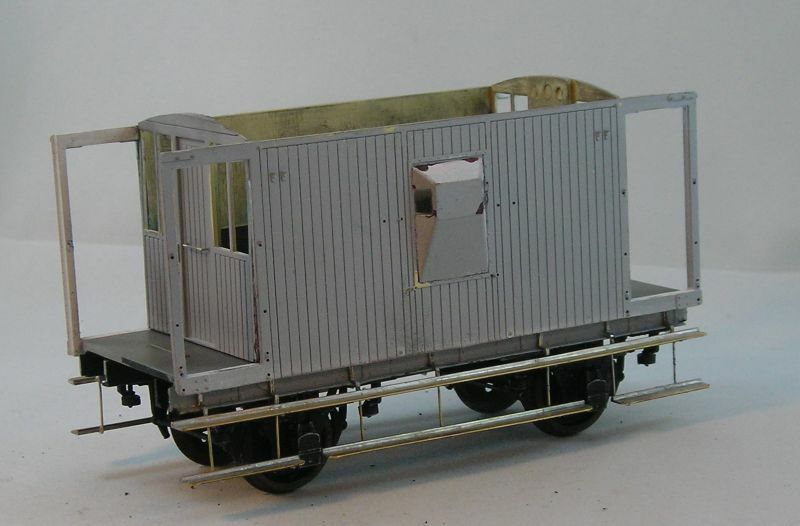 Don't rush and try to think ahead especially, as with the brake van, the interior needs doing. I tend to keep a paint plan in my head and try to anticipate whether further assembly can be done or if some painting needs doing first. I was looking at a list of October 00 releases from Bachmann and was struck at how much some of the stuff was. 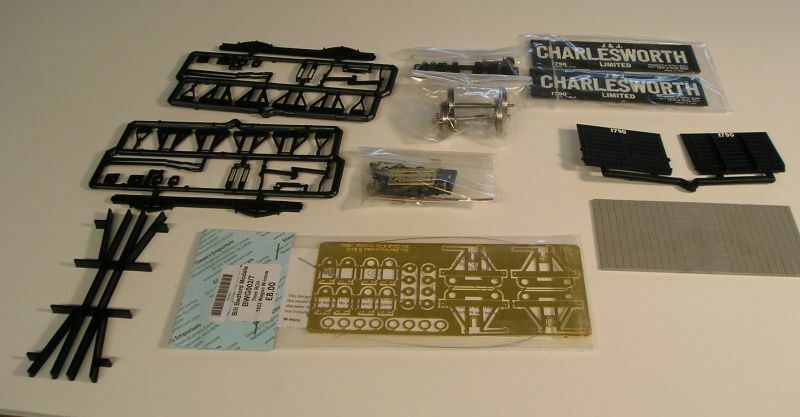 I thought to myself that O gauge stock and kits are looking to be priced quite reasonably in comparison. I spent some time this morning doing, among other things, the inside planking. Last night I started with light grey, dark earth and black. This was all acrylic and applied with the same brush while each coat was still wet. This am, I got out some similar Humbrol enamel colours and drybrushed. I'm lousy at drybrushing and it came out darker than I thought it should. 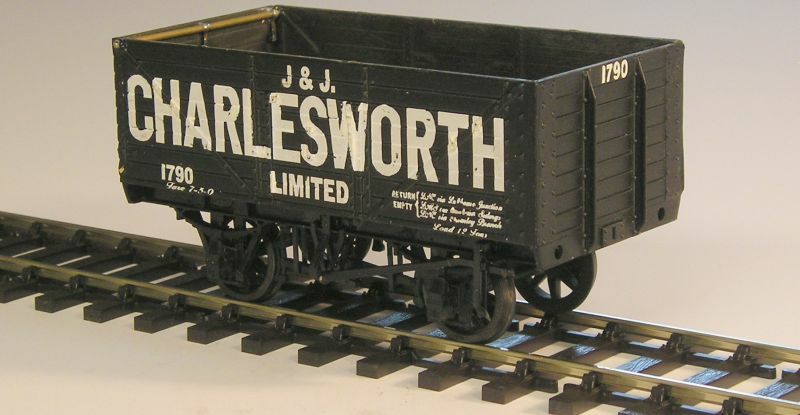 I then spent a lot of time with powders of various hues to try to give the surfaces the look of a wagon that has been carrying coal around for nearly 50 years. It's all very subjective but I think once it's together it'll look OK. I may yet load it up or perhaps make a removable load. The decorated sides will come in for severe distressing at some point. Brossard wrote: The bottle says "for brass" but it works on NS and steel. It won't work on Aluminum I believe. Nickel silver is a copper alloy, brass is copper/zinc, nickel silver is brass plus nickel. Selenium-copper based cold blackening works with ferrous metal including steel, copper-containing alloys, silver solder (which contains copper) but not stainless steel (which contains chromium). Blackening aluminum is possible, but as with all things aluminum needs a veritable witches-brew of chemicals to get rid of that oxide coating. The following is a good primer on blackening solutions. Always good to know some background on these metal processes. I only know that chemical blackening makes metal look good. Now the buffers are installed. With the guides already installed, it was a fiddle to get the nut on the buffer spindle. I'll pre-assemble the buffer and buffer guide next time. I didn't like my veranda guard rails so I did them again. I think they're better now. Paint touch up has been done, and by the magic of photography I see I missed a spot. Not unlike a 4mm wagon kit really just that much more detail. The door hinge at the upper left was made from brass tube and PB strip. The kit supplies plastic rod and very thin plastic strip. After two attempts to wrap the rod with strip and breaking it both times I went for a more robust option. I actually have a book on PO wagons and that was helpful in guiding me where the hinge should go. 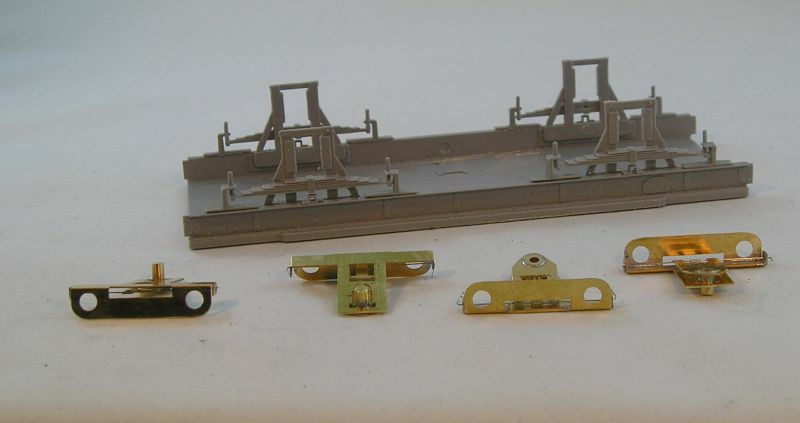 Some wagons had the hinge above the door as seen (and broken) on a lot of Bachmann wagons.